Droplet says: "Our sorting system for the NT is by date submitted. So, the sooner you send in your entry, the higher up it will be in the list... assuming we use it that week." Yes, this would be against the rules. 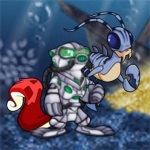 You may not sell Neopets, and therefore you may not sell equipped Petpets. The concept is similar to the fact that you can't get away with selling stolen goods by claiming you were actually only selling the bag they were in. We know everyone doesn't have the funds to complete faerie quests, so all you need to do is collect the free daily items to qualify. You're welcome to do Random Event faerie quests on your side accounts as long as they're funded by your main. However, the daily faerie quests like the ones from the event right now should only be done on your main account, as they are a daily / event from which you earn items, not Random Events. There you go! Ten outfits to mix and match, and that's not even counting paint brush clothing! :) Also, congrats on having an awesome sister. We agree! (Hey, some of us are Premium members, too.) And... well, you may remember a batch of surveys we set up for Premium members a few months ago? All that feedback has been read and read some more, and we'll be taking over the service completely soon so we can offer you more of the things you want. (There will be some casualties as well, but DON'T PANIC!) We can't talk about anything in detail just yet, but we're very close to an official announcement. You and your fellow Premium members will be getting an email in the next week or so outlining the changes more specifically. We'll also update the FAQ as we go along. Please watch your Inbox and New Features for more information. We discovered a glitch this morning with the new avatar, which was causing it to be granted in ways that were not intended. If you got it already, no reason to worry or write in, but we have also fixed the glitch so it will no longer be given out in this unintended manner. Some Neopets are just really good at giving backhanded compliments. As a courier for the Peophinny Express, he had discovered signs of a new maractite vein in that remote underwater village. His task was to lead his team back to the volcanic reef and investigate.